I love lamps, but I love when there is a trick in their design. Something special. 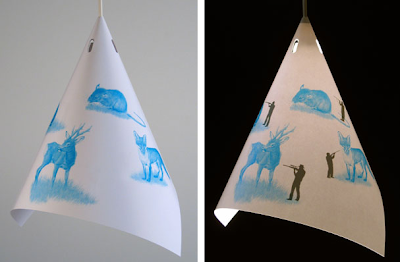 I found the "Bilderschirm" designed by 1kilo, a printed paper lampshade. The idea is simple: the design changes when you switch on the light. This lamp screen made of paper prints is a pretty amazing art piece and product. The idea is that when you switch on the lamp, the patterns transform and complete a scene. The scene is the art piece: all the animals are threatened by hunters and their riffles. Probably a little bit of questioning on our relationship to these pretty animals that we adore, use as ornament and also that sometimes we kill for fun. To assemble the lamp, you put the "Bilderschirm" around the bulb and insert the tab into the slot. 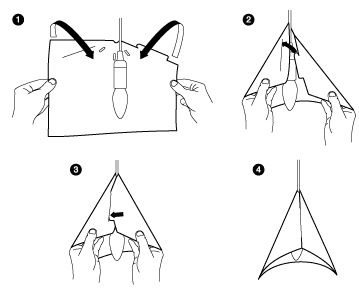 This simple mechanism makes it easy to remove and alternate between lampshades. Check also the cup that melts and the curtain for the lonely person that Jonah presented on the Make Blog.